The OCC and an alphabet soup of 5 additional regulators: FDIC, CFPB, FHFA, NCUA and the Federal Reserve issued a joint press release that if adopted, takes a small step forward in the regulation of appraisal management companies, who are largely responsible for the collapse of valuation quality since the credit crunch began. To many, this action is long overdue. Appraisal management companies control the vast majority all mortgage appraisals in the US, having been legitimized by HVCC back in May 2009. I’ve burned a lot of calories over the past several years pointing out the problems with the AMC industry so admittedly it is nice to see them getting attention. The fact that these institutions are not licensed to do business at a statewide level but the appraisers who provide the valuation expertise they manage is inconsistent at best. Still, the recognition of this regulatory glitch probably won’t have a significant impact on appraisal quality provided by AMCs. As my friend Joe Palumbo maintains, is like fool’s gold. I think proposal is at least a starting point. Require that appraisals comply with the Uniform Standards of Professional Appraisal Practice (today we had a clerical AMC staffer tell us that writing out the math calculations on the floor plan was a requirement of USPAP). Housingwire has a good recap of the proposed regulations and so does the Wall Street Journal provides a nice overview (I gave them background for the piece). The proposal by the Office of the Comptroller of the Currency, Federal Reserve and other regulators mandates that appraisal-management companies hired by federally regulated banks use only state-licensed appraisers with “the requisite education, expertise, and experience necessary” to complete appraisals competently. Moral hazard There is no significant financial incentive for lenders to stop accepting the generally poor quality appraisals the AMC industry presents them daily. The hope is that the additional regulatory largess the AMCs have to confront will force the issue with lenders simply because the AMCs will have to raise their fees. Without a real “value-add” to the banks other than cost control and fast turn times, the lack of quality for a large swath of AMCs may no longer be overlooked by banks. Yes I can dream. Residential appraisers, mostly 1-2 person shops, have largely been left without a voice and the bigger financial institutions have lobbied financial reform overtop of us without the regulators truly understanding what our role should to be to protect the taxpayer from excessive risk. Anumber of smart appraisers I know have created a petition whose sole purpose is the get the attention of the CSFB to address the issue of “customary and reasonable” fees. Our industry has no other way to reach the regulators or the ability to lobby our views in Washington. I hope they are listening. Floyd Norris’ Off The Charts column “Banks Out of the Woods? Maybe Not” had some sobering news from the FDIC. $1 of $8 in outstanding 1-family mortgage loans is to a troubled borrower. 40% of 1-family residential construction loans delinquent or uncollectible. Number of outstanding loans falling, even after adjusting for write offs. 2.9% of loans written off in 2009, highest rate in FDIC history. However this good news may be misleading – a regulatory change allows banks to only write down the exposure. RealtyTrac just released its monthly report covering January foreclosure activity. Nevada’s foreclosure rate remained highest among the states for the 37th straight month. One in every 95 Nevada housing units received a foreclosure filing during the month — more than four times the national average. Arizona’s foreclosure rate to second highest among the states in January. One in every 129 Arizona housing units received a foreclosure filing during the month. Foreclosure activity decreased by double-digit percentages from the previous month in both California and Florida, and the two states registered nearly identical foreclosure rates — one in every 187 housing units receiving a foreclosure filing. In other words, the foreclosure rush in December to file by end of year, then subsequent lull in January do not suggest that the foreclosure problem is improving if seasonality has anything to say about it. There has been a widely followed case reported last week where a Suffolk County Judge, Jeffrey Spinner, erased a $525,000 mortgage by the same California bank that bought IndyMac from FDIC after it went under. involved in a similar case in California, where it’s trying to foreclose on an 89-year-old woman, despite two court orders telling it to stop. I think its a bit early to get overly excited for the homeowner if you did when reading about this case since there is an appeal process. The stakes are huge and I would think a full court press by the lender will be in order. Plus, I assume this ruling simply disconnects the debt with from the property so it can’t be foreclosed, but the liability still exists, but without the house as collateral. Not sure about this legal point though. Ali Rogers over at CBS MoneyWatch in her must-read “Ask The Agent” column does a nice job on this ruling and provides more background about the bank. There was a recent article in Fortune that outlined the bias of the FDIC against private equity (hat tip: Bank Lawyer’s Blog), to the point where a foreign bank beat out a consortium of U.S. investors including Blackstone Group and TPG. The common perception is the private equity always behaves like this fascinating article about the fall of Simmons called “Profits for Buyout Firms as Company Debt Soared” subtitled: Flipped – how private equity dealmakers can win while there companies lose. I highly recommend the above NYT article, and the video series, although anti-private equity. Like homeowners under water with their mortgages, corporations can also be in the same predicament. And like the mortgage lenders who pushed bad mortgages, private equity also burdened perfectly good companies with excess debt. Whatever the approach, high leverage is vulnerable economic swings. Private equity serves a role just like mortgage lending does. We are currently in vilify everyone mode. However, I’m not sure that the FDIC is being prudent for good reason. Perhaps they are hoping to find money under the (Simmons) mattress. American University and MSNBC have combined to create BankTracker to show the general status of banks by focusing on bank capitalization. The American Bankers Association is against publishing such a list (I assume the fear of causing a run on under capitalized (higher ratio) banks even though FDIC insures the depositors in these banks. The American Bankers Association opposes the sharing of ratios like these with the public, and cautions that a heavy debt load does not ensure that a bank will fail. The FDIC has said its “problem list” of troubled banks rose to 416 at the end of June, but that list is secret, and there’s no way to know how much it overlaps with our list of banks with high levels of troubled loans. Of the 100 largest banks, Wachovia had the highest ratio. Colonial was second highest of the large banks and it failed last month. When looking at the highest levels of bad loans, Corus has a ratio of 3032.6 while JP Morgan, the nation’s largest bank is 26.4. While the depositors are protected, the banks are feeling rising pressure from bad loans and this is an important component of economic recovery. [NAHB] New Guidelines For Appraisers: Break Into Houses? Ok, so I’m kidding. But read further. In my previous post, I address the swirl of interest in the appraisal part of the home sale process brought about by NAR’s Existing Home Sale press release yesterday where they blame appraisers for preventing the housing recovery. On the same day, the National Association of Home Builders issue a press release specifically addressing the need for new appraisal guidelines. Betting money says the two organizations (NAHB & NAR) coordinated release to get more bang for the press buck, so to speak. Did you ever think something was terribly wrong, but you didn’t understand why? If you haven’t, then you should definitely read NAHB’s press release. I’ll lay it out here commenting on each paragraph. It you find it to be too much (most sane people), skip to the conclusion at the bottom. Using foreclosed and distressed sales as comparables with appraisals on single-family homes without adequately reflecting the differences in the condition of the respective properties is needlessly driving down home values, according to the National Association of Home Builders (NAHB). If foreclosures are competing with the open market sales in the neighborhood – guess what? That’s the market at that point in time. I strongly agree with their point that appraisers need to confirm condition of foreclosure sales if they use them as comps. It’s not that hard. AN APPRAISER SHOULD NEVER USE A COMP UNLESS THEY KNOW SOMETHING ABOUT IT. Otherwise, it can’t be comparable, by definition. Of course, the caliber of appraisers performing mortgage lending appraisals is falling rapidly with the proliferation of AMCs. That’s the real issue here. “Any home buyer can recognize the difference between a well-kept home and a distressed property that is damaged or not properly maintained. So it only makes sense that an appraiser should be required to consider the overall condition of a property and the specific factors related to a foreclosure or distressed property sale when selecting and adjusting the value of comparables,” said NAHB Chairman Joe Robson, a home builder from Tulsa, Okla.
We already are required to verify the sales to be able to make adjustments but the Cuomo/Fannie Mae deal called Home Valuation Code of Conduct (HVCC) has enable a whole army of inexperienced or incompetent appraisers at the expense of competent experienced appraisers who can’t afford to work for half price and turn around assignments in 20% of the time without verifying the data. I was told by a senior risk officer at a national lender that the bank uses several hundred appraisers in Manhattan. There are less than a half dozen long-time Manhattan-based firms here (with more than 1 employee). Where do all these companies come from? Out of state and up state New York. These appraisers will drive 3-4 hours to come to bang out a dozen reports in a day working for half the market rate. Appraisers are often only required to conduct exterior inspections of properties that are being used as comparables because they are normally unable to enter these homes and examine their interiors. Too often, properties that have been subject to foreclosure or distressed sales have issues related to deferred maintenance or internal damage that an external inspection simply cannot reveal. Think about what NAHB is saying here in the first sentence. We are not required to inspect the interior of the comps nor can we be made to. Do we have the right to go in all the comps? Simply walk up to the house across the street and say: “I am doing an appraisal of that house over there and the bank requires me to go inside your house and see what you have.” Good grief. A very poorly worded press release. The actual point they are making here is that they want the appraisers to consider the condition of the houses being sold at foreclosure and adjust for their inferior condition. NAHB is absolutely correct. However, the alternative bigger picture, between the lines, inference being delivered in the release is: ALL foreclosure sales are INFERIOR in condition to the house being appraised – that’s why they sell for less. That’s simply not true. Are they more likely to be inferior in condition than houses sold that are not foreclosures? Yes. The seller of a foreclosure is often a large institution not as close to the property as an owner occupant would be and may have a different objective/time frame than a typical seller might. You can’t mandate what comps to use, if they are “comps.” I don’t want the FDIC mandating what wattage of light bulbs I can use in my upstairs hallway either. However, I agree completely with the second point. NOTHING has changed to improve the quality of appraisals since the financial meltdown began. HVCC was intended to remove the high bias in valuation caused by the mortgage brokerage industry’s 60%+ market share of origination controlling and ordering the appraisals. That was removed with HVCC. The growth in mortgage broker market share of bringing business to the banks allowed lender relations with local appraisers and the existence of inhouse appraisal review departments to whither and die. The bank solution appears to be to use AMCs to order appraisals, a process which was enabled by HVCC, which is an accident waiting to happen. While mortgage broker ordered appraisals were biased high, AMC ordered appraisals are biased low. What about a neutral middle ground? Good grief. In neighborhoods where comps include a large number of short sales or foreclosures, appraisers should have the option of expanding the geographic area or extending the time frame for eligible sales to get a more representative basket of the value of homes sold in the area, Robson added. They basically want appraisers to ignore all foreclosure sales because they are “low” and be allowed to expand search guidelines to find higher sales. Property values in a neighborhood that are hurt by rising foreclosure activity isn’t caused by appraisers. They are competition to the non-foreclosure homes (and should be properly adjusted for condition). If the appraiser is determining market value of a property, he/she can’t cherry-pick the high sales. Their logic is a fall-back to credit boom reasoning which was all about finding the highest sales to make the deal happen. Currently, improper or insufficient adjustments to the comparable values of foreclosed and/or distressed homes often results in the undervaluation of new sales transactions. The best message in this release and it is absolutely true. Condition of the comps should be discovered and adjusted for. Otherwise they aren’t comps – they are merely sales. “This practice must be corrected because it contributes to the continuing downward spiral in home prices, forestalling the economic recovery,” said Robson. Overstated but not entirely incorrect, due to the growing AMC issue. The legion of incompetent appraisers being enabled through HVCC and AMCs are resulting in less accurate valuations. This problem sticks like a sore thumb in a declining market with low sales activity, compromising the public trust. Foreclosure comps are like the new breed of appraisal management appraisers proliferating in a down market. * The quality of appraisals should be much higher than it currently is, whether or not the housing market is rising falling or flat. * Nothing has been done to address the poor quality of appraisals performed for lending institutions. * National retail banks have all gone the AMC route to get their appraisers. 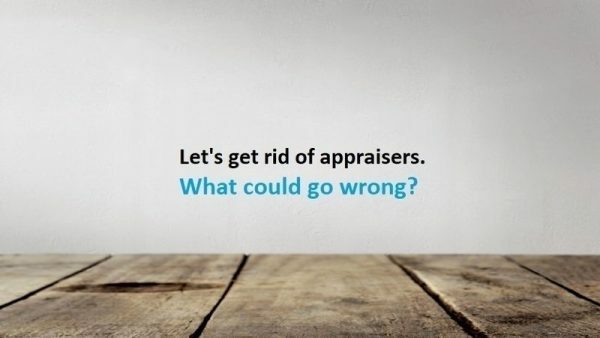 If the user of an appraisal report (bank, Fannie/Freddie, secondary market investor) doesn’t care about the quality and reliability of the valuation process, then the use of AMCs are enabled and becomes the new market for appraisal services, damaging the livelihoods of competent and diligent appraisers. The use of AMC appraisers is beginning to sound a lot like the way foreclosure comps are being used in an appraisal. Steve Forbes interviews FDIC Chair Sheila Bair on the credit crunch, systemic risk, “too big to fail”, toxic assets, shadow banking and others. The questions have the former presidential candidate’s less-government orientation and it’s a good interview. So, instead of hoping that these risks will be competently managed … we also need a “fail-safe” system where if any one large institution fails, the system carries on without breaking down. We need to reduce systemic risk by limiting the size, complexity, and concentration of our financial institutions. We need to create regulatory and economic disincentives aimed at limiting the size and number of systemically important financial firms. For example, we need to impose higher capital requirements on them in recognition of their systemic importance, to make sure they have adequate capital buffers in times of stress. If you don’t want to watch the video, here’s the transcript. I am doubtful any regulatory agency can prevent a catastrophe because they are human and are subject to mob mentality just like investors are. I see any such effort as simply reducing the odds of such an event. In this recent disaster, there were no tangible safeguards in place. I think she is one of the brightest leaders of all the regulators out there, but she was at the helm during this crisis and we saw little of her until things went wrong. Was she held back by the prior administration or simply now sees the light? Empirical evidence says that the myriad of alphabet soup regulatory agencies didn’t work to prevent the systemic breakdown of the financial system on a global scale, stemming from CMBC activity. Of course, I’m not naive to think that they would have prevented it, but I do think the scale of the crisis was significantly larger as a result of the lack of logical oversight. It’s not about lack of regulation, it’s about limited coordination, lack of responsibility and most importantly, departmental turf wars. Hopefully this may change in a few weeks as the administration takes the wraps of an emerging plan to reorganize regulatory oversight. Senior administration officials are considering the creation of a single agency to regulate the banking industry, replacing a patchwork of agencies that failed to prevent banks from falling into the worst financial crisis since the Great Depression, sources said. One of the key issues, which runs parallel to investment banks being able to select the most favorable ratings agency or mortgage brokers to pick their own appraiser, is the fact that banks can pick whichever regulator is most lenient: FDIC, OTS or OCC. Seriously, a regulator that is competing with other agencies to get more banks to work with them to justify their existence is inherently flawed. Good grief. Use of the word “Risk” and “Overload” seems kind of quaint at this point, doesn’t it? The proposal also urges creation of a new government agency to conduct “prudential regulation,” with supervision authority over state and federally chartered banks, bank holding companies and insurance firms, the source said. Yes the Fed will have new powers, but seriously, why have any of these agencies if they aren’t very effective? In the current format, it all seems like a colossal waste of taxpayer dollars unless the system is streamlined and reorganized. However, the turf wars will move from the regulators to Congress as everyone tries to hold onto their power base. The new bank regulatory agency could prove controversial because it would consolidate the Office of the Comptroller of the Currency and the Office of Thrift Supervision and strip supervisory powers from the Federal Reserve and the Federal Deposit Insurance Corp. Ideally, it is in everyone’s benefit to reduce the regulatory clutter and create clean lines of responsibility and authority. My worry is that we don’t jettison enough of what didn’t work after the power struggle/compromise struggle shakes out. Housing doesn’t stabilize until banking/credit stabilizes. Period. The FDIC has an interesting analysis provided by their economists on the varying impact of the recession on the four regions of the US: The 2009 Economic Landscape: How the Recession Is Unfolding across Four U.S. Regions. Of all the alphabet soup of federal agencies and their output on housing and economics, FDIC tends to be the best. Although the Industrial Midwest did not experience the significant home price appreciation of the post- 2001 housing boom to the same degree as other regions, its residential real estate markets have still suffered. Existing home sales in the Industrial Midwest declined 33 percent from their second quarter 2005 peak, roughly in line with the nationwide decline. In 2008, home prices fell in all of the region’s states, led by Michigan, where prices declined by more than 10 percent. Further, in half of the Industrial Midwest states, foreclosure rates are at or slightly higher than the national rate. Job losses and reduced compensation in New York City’s financial sector are also having a detrimental effect across real estate markets. Home prices in the New York City metro area declined by 9.2 percent on average in 2008. This year-over-year decline in home prices was the largest in the 22-year history of these data, slightly exceeding the previous high recorded in March 1991. Still, New York City home prices fell much less during 2008 than in some other major cities, which saw double-digit declines. Though the economies in the nation’s midsection continue to perform well relative to the nation, the downward trends in the energy and agricultural sectors may weigh on the region in the near future. Moderating commodity prices are likely to put a damper on the area’s economic conditions, and the region may not only cease to be a source of economic strength but also could enter recession at a much later stage than the nation. Download full report from FDIC. 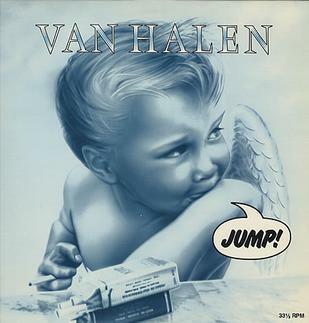 Last week, Dan Gross at Newsweek wrote a fun piece on Slate/Newsweek called “Jump” (not a a correlation with the old Van Halen song). Basically he says that nothing the government can do will fix the economy unless we participate. In the grips of a bubble mentality, we—as investors, consumers, and businesses—blithely assumed risk and convinced ourÂ­selves it was perfectly safe to do so. We bought houses with no money down, took on huge amounts of debt, and let the booming stock and housing markets perform the heavy lifting of saving. If everyone saves during a slack period, economic activity will decrease, thus making everyone poorÂ­er. We also need to start investing again—not necessarily in the stocks of Citigroup or in condos in Miami. But rather to build skills, to create the new companies that are so vital to growth, and to fund the discovÂ­ery and development of new technologies. I am not suggesting that shopping is solution, but it is certainly part of the problem right now. When consumers and investors hunker down and do nothing, a failure spiral results. Today Secretary Geitner announces the plan we have been waiting for, which is heavily reliant on the private sector. US Treasury secrectary Geitner unvailed his second attempt at getting the economy moving again and this time there is probably no room for a do-over. Did he really call it “My Plan”? We cannot solve this crisis without making it possible for investors to take risks. While this crisis was caused by banks taking too much risk, the danger now is that they will take too little. In working with Congress to put in place strong conditions to prevent misuse of taxpayer assistance, we need to be very careful not to discourage those investments the economy needs to recover from recession. The rule of law gives responsible entrepreneurs and investors the confidence to invest and create jobs in our nation. Our nation’s commitment to pursue economic policies that promote confidence and stability dates back to the very first secretary of the Treasury, Alexander Hamilton, who first made it clear that when our government gives its word we mean it. Of course Hamilton was shot dead in a duel. Let’s hope this strategy has a quicker draw and better aim. Here’s the official press release and fact sheet posted this morning. “We’ve got banks with a lot of toxic assets, what ‘toxic’ means is they are highly uncertain … so that is certainly the big picture, and that is going to be the main reason for doing this … We simply — we simply need them. We need them — you know, we’ve got a limited amount of money that the government has to go in here, so we need to partner, not just with private firms, but with the FDIC, with the Fed, to leverage the money that we have,”Â she said. $165M AIG bonuses (actually it’s $218M) and it’s symbolism of greed have been a distraction and we have to be very careful of taking our eye off the ball. Cut out the “Main Street versus Wall Street” homilies and let’s fix this. Congress underestimated consumer outrage and the House quickly passed retribution legislation to get even via a 90% tax. Because the political playing field is incentivized by one-upsmanship, Congress is much more comfortable with this sort of grandstanding/finger pointing and that’s what this debate has regressed to. Dodd is in hot water. It began with the previous legislation of caps on Wall Street compensation (when Congress didn’t catch it), while a feel good measure, is also a short sighted position much more apparent now because there will always be work-arounds. I love how many simply lump all Wall Streeters into one evil pile and feel it’s right to treat everyone the same. It’s professional prejudice on steroids. A market for the “toxic” assets needs to be fostered. Do we want to get out this mess or not? No room for populist shortsightedness. More on the plan later. In the meantime I need to download that song from iTunes – it’s systemic so we might as well jump.